We created this guide in collaboration with Catherine Edwards, a journalist currently living and working in Stockholm. Catherine served as our local expert, introducing us to the best areas to stay in Stockholm by neighborhood. We (Geoff and Katie) have added in hotel recommendations and other travel ideas to help with your Stockholm trip planning. Disclosure: This Where to Stay in Stockholm Guide contains affiliate links. That means we may earn a small commission when you use the links on this site to book a hotel, buy your travel insurance, etc.. You don’t pay anything extra. If you’d like to learn more about how this works, you can read more under our Disclaimer page. If you’re planning a visit to Sweden’s lovely capital, and are looking for the best places to stay in Stockholm, start with this quick guide to Stockholm’s best neighborhoods. Our Stockholm expert Catherine has written detailed suggestions about the best areas to stay in Stockholm later on in this Stockholm Neighborhood Guide, but we also wanted to create a quick-guide summary of our top ideas for where to stay in Stockholm’s different neighborhoods. Each of the neighborhood names is clickable, and will take you to more detailed info about that section below. But for now, here’s a summary of Stockholm’s best neighborhoods! Gamla Stan: Literally the ‘Old Town,’ Gamla Stan is the bright and colorful Stockholm of postcards, with tall and narrow buildings clustered around a lovely old square. The heart of the tourist city, expect to fall in the love with the charm, not the prices. If you’re open to splurging or want to be ultra central, Gamla Stan might be the best area to stay in Stockholm. Östermalm/Norrmalm: The business district and high-street shopping area, this area is the best area to stay in Stockholm for business trips, and anyone who wants to be right downtown. Many of the hotels here are international chains, and most are within walking distance of the central station. Södermalm: One of the coolest neighborhoods in Stockholm, Södermalm is full of cafés, comparably affordable food and drink hot spots, hipster bars, and great views. Södermalm is one of the best places to stay in Stockholm if you’re looking to discover the edgy and cool side of Sweden’s capital. Söder om Söder: Located south of Södermalm, this is a mostly residential area with an up-and-coming vibe. Catering to locals (rather than tourists), it has some good budget accomodation choices, and local prices for food and drink. Djurgården & Skeppsholmen: The greenest of Stockholm’s city islands, this is where you’ll find the ABBA Museum, the Vasa Museum, and Skansen living museum. If the museums are your main reason for visiting Stockholm, or you’re travelling as a family and want some peace and green space, consider staying on Djurgården or Skeppsholmen. The Archipelago: If you want to get out of the city, the surrounding archipelago is full of hiking, swimming, and beach-side activities to keep you busy, along with some popular museums. Your best bet for staying in this part of Stockholm is to get a holiday apartment. So….Where Should You Stay in Stockholm (A Summary)? When I first moved to Stockholm, the first thing I noticed was just how much water there was. As my plane began its descent, we were treated to spectacular views of the frozen-over lakes. Fourteen islands make up the city, and to the east you have the archipelago, formed of almost 40,000 more islands scattered across the sea. As well as being beautiful, the water plays a central role in Stockholmers’ lives. It’s so clean that in summer, you can join the crowds that flock to the city’s (tiny) beaches and jump into the lakes for a swim, while winter sees locals walking or even skating on the thick ice – join them if you dare! Stockholm’s neighbourhoods more or less coincide with the different islands within the city, each with its own distinct identity, sights and gems to discover. It’s a small but vibrant city, so I recommend staying as centrally as possible in order to reach most of the main sights on foot. And if you get bored of walking, a boat trip offers the chance to see the city from a different perspective, whether you have enough time to take a cruise through the vast archipelago or simply hop on the seven-minute ferry between two tourist hotspots, Gamla Stan and Djurgarden. Gamla Stan, literally ‘Old Town’, is the most ancient and best-preserved medieval town centre in Europe. Prepare to fall in love with its narrow winding streets, each lined with colourful buildings housing cafes, bars and shopping spots. The main square, Stortorget, is one of the city’s most photographed spots, and hosts the Christmas markets every winter. Gamla Stan is also home to the Royal Palace, where you should watch the changing of the guard at least once during your stay. There’s a fee to go inside the palace itself, but two of its museums, the Royal Armoury and Royal Coin Cabinet, have free admission and a treasure trove of interesting exhibits. Now for the bad news. Accommodation, food and drinks never come cheap in the Swedish capital, but Gamla Stan is the priciest area – and if you come in the summer, you’ll have to do battle with crowds of fellow tourists. If you’re willing to splurge, or desperate to be in the very centre, Gamla Stan is a great area to stay in Stockholm. But if neither of those apply, I’d recommend staying on a different island, making sure to explore Gamla Stan during the day. Hotel Sven Vintappare – Offering traditional but modernized rooms in a historic 17th-century building very close to Västerlånggatan shopping street. There is a cute cafe on the ground level which serves breakfast. The old town location is close to The Royal Palace, Stockholm Cathedral, Stortorget Square (just a 2-minute walk) and lots more. Past guests have noted the rooms are a little small, and there is no lift in this 4-storey building, but overall it’s highly rated and charming. Lady Hamilton Hotel – A family-run hotel housed in a 15th-century building, the hotel has been modernized and fitted with a sauna, and the 700-year-old wine cellar is now a plunge pool! There is coffee and tea on each floor; lots of antique decorations both in and out of the rooms; soft, comfortable beds; TVs and a minibar. The hotel does have a lift, and is very close to everything in the old town, as well as the metro. A 2-minute walk to Stortorget Square. Residence Perseus – This property offers eight different short-term apartment options, from studios and one bedrooms to a suite that sleeps 10 people. The apartments are modern, clean and cozy, with full kitchens and laundry facilities. Past guests have commented on the great level of attention they received from the staff. Very close to the Royal Palace and Stockholm Cathedral, and many other old town attractions. The metro is also just a 7-minute walk away. This is the elegant business district of Stockholm, ideal if you want to be close to the Central Station or do some shopping: Drottninggatan is the main high street, and don’t miss swanky Swedish department store NK. Finding a hotel to suit your taste and budget shouldn’t be too difficult – you’re more likely to find upmarket chains than the quirky hotels and hostels in other parts of the city. The recently-opened Generator Hostel in Norrmalm, close to the train station and boasting an impressive bar, is a great option for younger travellers on a budget. There’s plenty of culture to enjoy here, from exhibitions and shows in Kulturhuset to a variety of churches and parks (the best being Humlegården), and Kungsträdgården, which hosts an open-air ice rink in winter and a variety of festivals and events throughout the year. And you won’t go short of places to eat, drink or dance in this area – just be aware that the vibe here is much more upmarket than Södermalm. Stureplan, the square which joins Norrmalm with Östermalm, is the place to see and be seen, but expect to wait in line for a while before getting into one of its exclusive clubs. Hotel Diplomat – This is arguably one of the more recognizable hotels in the city, with an impressive Art Nouveau facade facing the bay. Every room has high-quality premium beds, bedding and blackout curtains (necessary in summer), and deluxe toiletries in updated bathrooms. An on-site restaurant, seasonal terrace, and fitness facilities available to all guests round out the offering. Walking distance to the Royal Palace and Vasa Museum, a 6-minute walk to two different metro stations, and directly across from ferries to other islands in the Archipelago. Miss Clara by Nobis – A relatively new design hotel, Miss Clara offers modern with tasteful designer touches throughout, with a restaurant, bar and a free sauna on-site. Guests will find brand-name toiletries in the modern bathrooms, smart TVs and high quality beds and linens. Located very close to the Drottninggatan shopping street, it’s a three-minute walk to the metro, or a 20-minute walk to Gamla Stan. Radisson Blu Waterfront – One of the city’s best-selling hotels due to the location at the Congress Centre and right across from Central Station, overall this property seems to appeal more to the business traveller. However, the water-facing rooms provide some excellent views, so you may not want to count it out for leisure! There is a bar and grill on-site, as well as a cocktail bar, but there are plenty of other options around the hotel. If you don’t want to take transit, a 15-minute walk will get you to the Royal Palace and Gamla Stan. Hotel with Urban Deli – How can you say ‘no’ with a name like that? A fun and modern-industrial design hotel that’s actually located below ground (below…you guessed it…an urban deli)! Uber modern, hip & trendy, this is a creative and fun option, although perhaps a bit too much for some travellers (bathrooms don’t offer a lot of privacy from the room). If you’re comfortable with your travel partner and game for the cool vibe, look no further! A short walk to the metro, 15-minute walk to Gamla Stan, and walkable to many other sites like Hotorgshallen, and plenty of bars and restaurants. Having lived and worked on Södermalm for most of my time in Sweden, some might say I’m biased, but the area is definitely the ‘cool’ bit of the city. New cafes seem to spring up every other week, and you’ll find all kinds of food and drinks at slightly more purse-friendly prices than in the north of town. After Gamla Stan, it’s probably the most photogenic area: take in gorgeous panoramic views on a walk along Monteliusvägen or Fjällgatan, and keep an eye out for the traditional wooden cottages dotted around the island. To the south-east of the island, the SoFo district is known for its vintage shops, hipster bars and quirky cafes. Try Gildas Rum or Alskade Traditioner for vintage decor and great tea and waffles respectively, or if your priority is high quality Swedish coffee, head to Fikabaren. Hornstull, in the north-west of Södermalm, is the best place in the city for food, with purse-friendly options from all kinds of cuisines. It also hosts an outdoor market by the beach in summer. Connected to Hornstull is the smaller island of Langholmen, a tranquil paradise perfect for nature-lovers. This green oasis has a dark past, however; it used to be a prison island, and the former jail is now a hotel and hostel. Another unusual accommodation option would be to stay in one of the boat hotels moored along the north of the island. Hotel Rival – An artsy design hotel with updated rooms, this property is filled with splashes of color and an upbeat vibe. Past guests found the rooms to be bright, modern, and airy, with the comfortable beds and soft linens mentioned as highlights in many reviews. Located in a safe, quiet area of Södermalm, with a number of art galleries and trendy cafes nearby. Nofo Hotel – A 4-star hotel with uniquely themed rooms, this is another fun and funky choice complete with antique furniture and old world charm. Set in trendy SoFo, past guests love the proximity to secondhand stores, coffee shops, and excellent bars and eateries. Great access to public transportation, within a young, fun, and local setting. Motel L – Offering wallet-friendly rates and a bright and funky ambience, this hotel seems to do a good job at blending affordability and quality. Reviews give high praise to the stylish rooms, which have renovated bathrooms and rain showers. The hotel is situated just outside the city center and Södermalm, but is well connected via public transportation, with a bus stop and tram station located within a few minutes walk. The area south of Södermalm is quieter and more residential, but a good choice for budget travellers – or anyone who likes to see up-and-coming neighbourhoods before they’ve hit the pages of most travel guides. It’s also great for return visitors looking to explore a new side of town: enjoy a fika (Swedish coffee and cake break) or meal here without the crowds and inflated prices of the centre. It might sound odd to say the cemetery is one of the highlights, but the Skogskyrkogarden or Woodland Cemetery is a lovely place for peaceful walks and striking photos. On a more lively note, see if your visit coincides with any good concerts or sports games at the Globen stadium, and take a free brewery tour at the massive Nya Carnegiebyggeriet. Bo Hotel – A bright and funky 3-star hotel that has embraced sleep-box capsule rooms for budget travellers, and traditional rooms for those who don’t mind a slightly higher price tag. Past guests seem to appreciate the good value for money and bright, cheerful and clean rooms. It’s only a 5-minute walk from Bo Hotel to the nearest metro, making the city centre accessible for exploring. Quality Globe Hotel – A contemporary hotel with a bit of an artsy-design vibe, this property offers updated rooms and is filled with splashes of color and an upbeat vibe. Past guests found the rooms to be bright, modern, and airy, with comfortable beds and soft linens mentioned as the highlights in many reviews. Located right next to Tele2 Arena, Globen Shopping Centre and Ericsson Globe Arena, it offers easy metro access to the center in an off-the-path area for tourists. Maude’s Hotel Enskede – This 3-Star hotel offers an informal and cozy atmosphere amongst the otherwise modern, glossy hotels of Stockholm. A number of guests comment on the friendly, welcoming staff and home-like atmosphere that is created by the casual, comfortable décor. Situated in a laidback, residential neighborhood, Maude’s allows visitors to experience a local version of Stockholm, while still being accessible to the historic city center via metro. Djurgården is the greenest of all the islands, perfect for dreamy walks that make you forget you’re in a capital city. It also houses Skansen, a living museum with old-style shops and Scandinavian animals, and several more of the city’s best museums. The ferry from Slussen (included in your transport pass) will drop you off outside Gröna Lund, a theme park which puts on live music shows (sometimes hosting quite big names) and dance nights through the summer. Best-suited to families or museum junkies – though there isn’t a lot of choice here in terms of accommodation. Nearby Skeppsholmen, a tiny island with more than its fair share of museums, has a better selection of hotels and hostels, and you can easily take the ferry between here and Djurgården. Pop House Hotel – Located beside the ABBA Museum and the Swedish Music Hall (in the same building), this hotel has a sleek and comfortable ambience, surrounded by lots of greenery. Walkable to the water, and just a 5-minute tram ride to the centre also makes it relatively convenient, in a sleepier area. There’s a restaurant in the hotel, but no coffee making facilities in the room. It’s within walking distance to the Vasa Museum, Skansen open air market, and Gröna Lund (amusement park). Scandic Hasselbacken – With an aging but elegant look to it, this hotel has an on-site restaurant with seasonal terrace, and a fitness center complete with sauna and cold pool. Rent a bicycle and explore the island, or walk to the water. Past guests have said the rooms are basic with comfortable beds, but everything seems a bit dated. Very close to the Vasa Museum, Skansen open air museum, and the ABBA Museum, and just a 5-minute walk to tram and bus. Skeppsholmen Hotel – Directly across the water from Djurgården, this hotel offers a mixture of traditional and modern decor and designer fixtures. Offering large, comfortable beds, soft pillows and modern bathrooms, an on-site gym for fitness buffs, and a restaurant that gets great reviews from past guests. Great views of Old Town from the island and some of the hotel rooms, and Skeppsholmen is served by regular ferries to get around. Less than a 5-minute walk to the water. Often overlooked by visitors, charming Kungsholmen is a mostly residential island. When it comes to sightseeing, it has little to boast other than City Hall, but it’s a good choice if your priority is having a relaxing stay, and the waterfront walks are simply beautiful. In the summer, go kayaking in the water, or head to the beaches of Smedsuddsbadet and Fredhällsbadet – at the latter, you might see experienced swimmers leap from the rocks into the crystal clear waters of the lake below. What’s more, tourists who opt for Kungsholmen over the more obvious areas will be rewarded with better value food, drinks and accommodation. Start the day with breakfast at La Petite France, and reward yourself after a day of exploring with a trip to the Lemon Bar for cocktails and a soundtrack of Swedish electro-pop, or to Proviant or BrewDog for their wide selections of craft beer. Courtyard by Marriott Stockholm – A pleasant hotel offering everything you’d expect from the Courtyard Marriott brand: clean, decent-sized rooms with coffee and tea making facilities, modern walk-in showers, a well equipped gym and a “Grab n’ Go” convenience store on-site. The hotel features its own restaurant as well, and some rooms offer great views. About a 5-minute walk to the metro, and about 10 minutes to the beach. Hotell M/S Monika – If staying on an early 20th-century ship sounds intriguing, this is a great bet. There are just 4 guest rooms, each with a modernized private bathroom, on the ship. Past guests have noted this is enjoyable for the experience, but it does lack some functionality. If you have mobility issues, this may not be for you as there a steep ladders to negotiate. Ahoy! Clarion Hotel Amaranten – This is a chic 4-star hotel with an urban flair, located in a concrete, modern building just outside Stockholm’s city center. Prior guests appreciated the cozy rooms and liked the live music at the hotel’s bar, although it could be disruptive for guests wanting peace and quiet. The hotel is located a mere 3 minutes from public transportation and a short 10 minutes walking from Stockholm City Hall. Where to Stay in Stockholm: Stay in the Stockholm Archipelago if you Want to Get Away From it All! When Stockholmers want a break from the buzz of city life, they head for one of the archipelago islands. Follow their lead and you’ll be rewarded with fantastic nature and endless opportunities for hikes or swimming. The archipelago is home to some tourist favourites, including art museum Artipelag and Vaxholm’s fort and museum, or you could go remote and camp at one of the further out, more deserted islands. Resarö Lakeside House – A lakeside home that sleeps up to 12 people, this property has a family-friendly atmosphere and great location. There are a total of 7 bedrooms and 2.5 bathrooms, plus an outdoor shower. Past guests liked the views and outdoor amenities, including a jacuzzi, sauna, outdoor heating on the veranda, BBQ, and outdoor fireplace. The property is not far from the ferry from Stockholm or a taxi-boat from Vaxholm/Resarö. Kummelnäs House – The property is a waterfront cottage with plenty of natural light and large windows with views across the water. It is a one bedroom, one bathroom house, with the potential to sleep up to 4 people. Prior guests said it has a peaceful atmosphere, due to its location on the water. It offers a retreat from the city for long-term visitors, without the inconveniences of a remote location. Resarö House – Stay in a beautifully restored and maintained home right near the water at this vacation rental property. The house can sleep up to six people and has a fully equipped kitchen, with all modern appliances. Despite the recent renovations, guests appreciated the historic touches and aspects of this house, and loved access to a private jetty. The home sits on a quiet part of the archipelago, making it a good choice for families. Hopefully, we’re answered most of your Stockholm neighborhood questions and given you an idea about the best area to stay for your trip. However, we’ve also included a few travel tips and answered some questions we know you’ll probably be wondering about. As we get questions from more readers, we’ll do our best to update this section over time. So Where Should You Stay in Stockholm? Ostermalm/Norrmalm is an ideal area to stay in Stockholm if you want to wine and dine in the more elegant parts of town, are visiting Stockholm on business, or want to have convenient access to high-street shopping as well as upmarket brands. Both Djurgarden and Gamla Stan are great areas to stay in Stockholm for families and museum geeks, though there are fewer accommodation options in these tourist hotspots, and what’s available can be more expensive. Södermalm tends to attract a younger crowd in search of Instagram-worthy streets and bars, and is great bet for those looking for a hip side of Stockholm. Kungsholmen is a great place to stay in Stockholm for a peaceful stay just a stone’s throw from the centre. If you’re more adventurous and looking to explore away from the beaten track, try Söder om Söder or any of the archipelago islands for a taste of true Swedish life. If you’re planning to travel independently to Stockholm, and around Sweden or Scandinavia more broadly, our experience suggests you’ll find everything pretty manageable. Swedes generally have a very high level of English, and it’s unlikely you’ll have many ‘lost in translation’ moments. That said, we get the impetus to join a tour, and simply have everything taken care of – also a great option if you’re limited on time during your trip, or you don’t have time to plan a trip. We tend to do most things ourselves, so don’t have a lot of personal experience to recommend tours. However, there are loads of reputable companies out there that seem to get great reviews and deliver a fantastic guest experience. Companies like G Adventures (which unfortunately don’t seem to operate in Sweden), Trafalgar / Contiki / Insight Vacations (owned by The Travel Corporation), and Intrepid / Peregrine / Geckos (owned by Intrepid Group) seem like a generally safe bet for value and experience. Intrepid currently offers 6 multi-country Scandinavia tours that include Sweden, ranging from their 8-day Taste of Scandinavia Tour (which goes from Berlin to Oslo but, unfortunately, includes Gothenburg but not Stockholm) and 15-day Scandinavia Explorer Tour, to the monster, 36-day Scandinavia and Baltic Circuit, and others in between. Check their Sweden tours home page for more options and info. Trafalgar also has a variety of Sweden and Scandinavia itineraries worth considering. Their 13-day Capitals of the North tour covers lots of ground, starting in Copenhagen and ending in Moscow. Their Scenic Scandinavia tour covers more traditional ground, taking you through Denmark, Norway (hello, fjords!) and Sweden. They have many more options, which can see on their Sweden Tours Page. Stockholm in One Day Tour — As the name suggests, it’s a glimpse of everything in one day, perfect for getting a snapshot of the city’s highlights to further explore on your own (or see the main sites if you’re short on time). Lasting 2.5 hours, the tour covers City Hall, the Royal Palace, the Vasa Museum, and Djurgården, and is capped off by a one-hour boat ride through the archipelago. 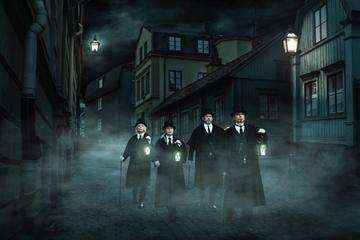 Stockholm Ghost Walk & Historical Tour — A well-liked tour in Stockholm, past reviews suggest people were rather surprised at how much they enjoyed it. Over a guided 2-hour walk through Gamla Stan, you’ll hear tales of murder and mystery, legends and tales of medieval Stockholm. Reviewers have said it’s fun for the kids as well. Viking History Daytrip Stockholm & Uppsala — An 8-hour full-day trip delving into the life and culture of the Vikings. 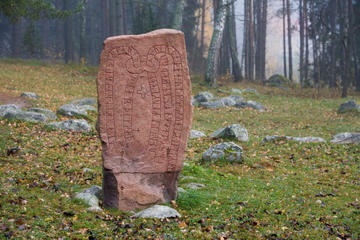 You’ll see Viking ruins and relics, burial sites and inscriptions. See some of Sweden’s finest countryside and oldest towns as you visit Uppsala and Sigtuna. Tour includes hotel pick up and drop off in a comfortable mini bus, and your guide. Once you’re in Stockholm, the underground (tunnelbana) is the easiest way to get around, with three lines: Green, Red and Blue. Tickets for individual trips are relatively expensive so you’ll be best off buying a one-day, three-day or seven-day pass, which you can get at any station. These passes also cover the comprehensive bus and tram network, and even a few of the local ferries. Single journey tickets cost 43SEK ($4.80US) and are good for 75 minutes of unlimited travel on the metro, tram or bus. There is a discounted rate for seniors over 65, and juniors under 20 which go for 29SEK ($3.75US). A 24-hour pass costs 180SEK ($14US), and has a discounted rate, 80SEK ($9US), for those under 20 and over 65. A 72-hour pass runs 240SEK ($27US), or 160SEK ($18US) for under 20 and over 65. The seven day pass goes for 315SEK ($35US) or 210SEK ($24US). Find out more here. The underground lines have been called Stockholm’s biggest art museum, with the majority featuring Instagram-worthy art installations. My favourites are Stadion (red line), Kungsholmen (blue) and Östermalmstorg (red). 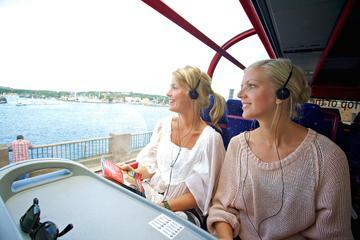 Alternatively, get yourself a Stockholm Pass and take advantage of the Hop-on, Hop-off bus and boat network, and access to many of Stockholm’s attractions. How to Get From Stockholm Airport to the City Centre? If you’re flying in to Stockholm, you’ll land at either Arlanda, Skavsta or Västerås airport. Arlanda is the most central, with the option of the 20-minute Arlanda Express train or (cheaper) 45-minute bus to the central station. The Arlanda Express is very comfortable and has free WiFi on board and the normal cost is 280SEK ($31US) for a single ticket, one way, or they have a special rate for groups of 2, 3 and 4 passengers travelling together so make sure you take advantage of that. You can get train tickets for at the airport or the machines on the platform, but you can buy tickets in advance on the website and save big money the further out you book. You can also take the Airport bus to the city, bus tickets can be purchased via the Flygbussarna app, or pre-purchase your bus ticket here. The bus will take you to Stockholm central station, the same as the train, in about 40 minutes. The bus runs 24 hours a day, 7 days a week and goes every ten minutes or so. The other two airports, Skavsta and Västerås, are served by budget airlines and are further out from the city, but connected by buses which time their departures with flight arrivals. Our goal with this Where to Stay in Stockholm Guide (and our Where to Stay in Amsterdam, Where to Stay in Berlin, Where to Stay in Prague Guides…you get the idea) is to make trip planning a bit easier, so you can find the best area to stay in Stockholm without having to spend hours on the Internet cross-checking locations. We decided the best way to do that was to hire locals, or people who know a city really well, to write these guides, and we’re happy Catherine was able to help us out with this guide! While our local experts know the neighborhoods well, they don’t necessarily know the hotels. We currently live in Budapest, but we live in an apartment, not a hotel (of course). And given that it’s not realistic for to send a writer to check out every hotel, we have to rely on crowdsourced reviews and info available online (i.e. Google Maps) to select what we think are the best hotel choices in each neighborhood. At the end of the day, we list the hotels that — based on our research — we would love to personally stay in, or would be happy suggesting to a friend or family member. We haven’t personally been to these hotels, but we’ve ask ourselves things like: Have past guests left fantastic reviews? Does it look like somewhere I’d like to stay? Does it seem to be in a great location for enjoying Stockholm? If it ticks those boxes, we’ve added it to the list. Hopefully this info will help you have a better vacation, but at the end of the day, we figure you’ll also do your own research. Catherine Edwards is a journalist who has been living in Stockholm since October 2015. You can follow her on Twitter or Instagram, where she posts about Stockholm and her travels further afield.